The Abbey Church is where the monks gather to do the Work of God, that is to pray the Liturgy of the Hours. 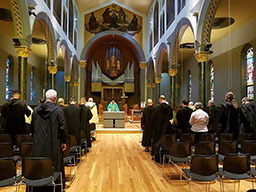 The monks also celebrate the Holy Sacrifice of the Mass with the wider community each day in the Church. The Perambulatory is where the monks gather in statio (by date of entry) before they process into church for prayer. 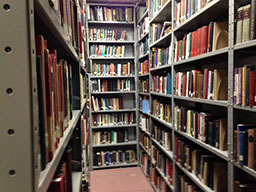 The perambulatory is a place in which most monks are able to quietly recollect and prepare themselves for community prayer. The Cuculla Room is where the monks hang their Cucullas and albs (for those who are priests). 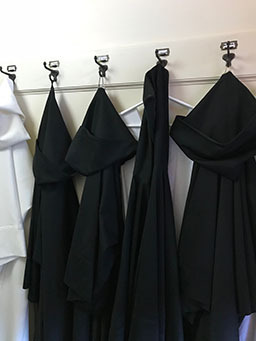 The Cuculla is a robe worn by Solemnly Professed monks (those in vows for life) The Cuculla is believed to have been the habit of our Holy Saint Father Benedict. The Refectory is where the monks and their guests gather to eat. 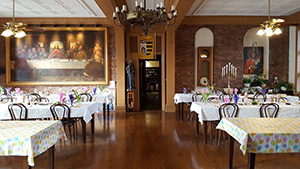 The Refectory features a wall length painting of the Last Supper just behind the Abbot's table. 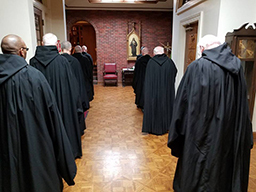 The monks also listen to passages from the Rule of St. Benedict and various books during table reading in the Refectory during meals on most days. On special feast days after the reading of the Rule all proclaim "Thanks be to God" and their is talking at table. 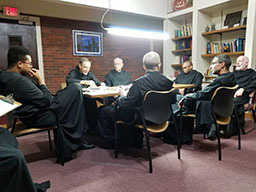 The Chapter Room is where the monastic community meets with the Abbot to discuss and vote on important issues of the day. It is also often where novices are greeted and accepted into the community. 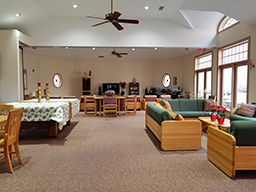 The Hospitality Center is a place where guests of the community and visitors can gather with the community or for special events or meetings. The Infirmary is where monks who are sick or elderly and in need of more direct medical care go in order to recuperate for periods of time when necessary. The infirmary allows monks with less severe illnesses to remain at home and be able to receive guests without disrupting the usual flow of monastic enclosure and practice. 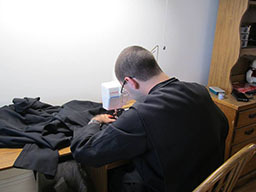 The Tailor Shop is where monastic habits are repaired as well as other items of clothing. Currently the tailor shop is staffed by two monks. This allows us to quickly repair garments and save on the cost of having work done outside. 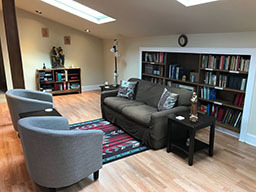 The Novitiate Library is where novices and juniors can go to read, study, research, and meet with the novice/ junior master for their weekly classes. The space has recently been renovated and is a comfortable and inviting space in which to work and meet. The Abbey Chapel/Oratory is where monks can go to visit the Blessed Sacrament, do lectio divina, or pray privately within the house. 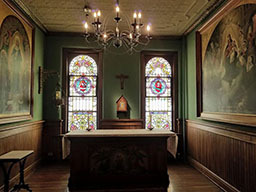 The chapel features beautiful paintings with scenes from the Life of Saint Benedict. 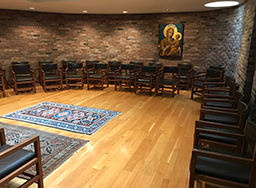 The Community Recreation Room is where the monks gather to talk, read the newspaper or magazines, and gather for informal community time during the week.